A jammed packed week in the club, it was great to see the club house so full for St. Patrick’s day after a great day at the parade. A big thanks to all those in the juvenile section for organising and volunteering with the parade and events, and Jackie for the wonderful entertainment in the club for the kids. The Healthy club also organised a great event, and a very special thanks to Shane Carthy for sharing his story, very inspirational for our young and not so young members. No adult games last weekend and some of the Juvenile games were called off, we had some CCC1 football action, report below, also well done to the Ladies 16A footballers on their win, match report below. Hard luck to our 14A hurlers who lost out to Thomas Davis in Div 1 watch out for the match report in the Echo. This week sees both our Minor Ladies footballers play Saturday, both at home at 3pm, then Sunday sees our three adult hurling teams all in action, Seniors away to Ballyboden at 10:30 , JnrA away to St Oliver Plunkett ER at 12, Jnr B away to Realt Dearg at 3pm. Our Senior 1 Camogie team also have their opening league game Sunday at home to St Oliver Plunkett ER at 10:30. Our three Minor football teams are also at home at 11am Sunday. The Senior Camogie team are running a Table Quiz THIS FRIDAY the 22nd March as they prepare for the season opener. 8.30pm in the club house, support always welcome and appreciated. A massive win for the Dublin senior hurlers and well done to our own Chris Crummey captaining the side too a long awaited win vs Tipp in Thurles, we wish them luck in the semi-final vs Limerick. Commiserations to Abbey Shiels, Laura Quinn and Katie Wisdom as the Dublin minor ladies football lost out in Championship. Lucan Sarsfields Easter Camps are fast approaching, details are below, register through the link now so as not to miss out. Monday 15th- Thursday 18th April from 10:30-2:30. School of Excellence for u13-u15 players which is €50. Lotto There was no winner of the lotto on the 14th March, Numbers were 1, 7, 9 and 17 . Next weeks’ jackpot €2,600, the draw will be managed by Edel Mooney and is sponsored by Lucan Village Pharmacy. Lucky Dips Winners: Aoife Roche, Bec McCarthy, Brian Kearney, Paul Murray, PJ Finnerty. Play Online here, Or Tickets can be purchased at the Club, or in Kenny’s Vesey Arms. Our deepest condolences to the Freeman family on the recent passing of Tom. May he rest in peace. St Patricks College, Drumcondra 4:45pm. Due to pitch un-availability in Lucan for the last two weekends, this game was rescheduled for the Bank Holiday Monday in Drumcondra. Na Fianna got off to a great start with two fine goals from play, and it was midway through the half before Lucan registered their first score, a point from play. Playing up the slight hill on a pitch in surprisingly good condition after the recent wet weather, the Sars Girls got to grips with the game and created plenty of scoring chances, but were denied twice by Na Fianna and Dublin U16 Keeper, Molly Cassidy. Sophie Smith did get one past her though, but the north-siders added another goal of their own, and a few points, but it was the girls in green who were working hardest, but still went in at halftime 5 points down, Na Fianna 3:02, Lucan Sarsfields 1:03. Many of the games this weekend fell foul to the adverse weather conditions but there were still some games played in the CCC1 group. On our 1st visit to St Catherine’s park, and in what were tough conditions the Boys Played some super football. The first half they were against a strong wind and driving rain, but the boys played some super passing football to work some great scores with Derry, Aidan, Rory and Jack all scoring great points. Fingallians worked hard through out but Lucans Boys were on top right from the start and kept working hard and supporting the man with the ball at all times. Conor G, Conor R, Niall and Evan all played superb in the backs and dealt with any attacks from Fingallians . Ray in midfield and Nathan in forwards played superbly reading the play and getting blocks and tackles when needed. The second half showed just how much these boys have improved barely letting Fingallians out of their own half for most of the play. Again some great scores with super support runs and fist passing and kicked passes turning Fingallians defence too quickly and scored were taken well. With some more accurate kicking all players would have got a score and the boys were very pleased with a 2nd half performance which showed them what they can do when the concentrate fully and each player does his job and supports his team mates. On the other 2 pitches Lucans Boys showed great skills and tough tackling when needed to make what was a wet and windy morning a great success for Lucan Sarsfields U10 footballers. Thanks to all the boys and parents for coming out in tough conditions, and also to all the coaches for their efforts. Squad: Team 1: Derry Ware, Jack Taffe, Conor Ryan, Aidan McCabe, Conor Gilmore, Nathan Dooley, Niall Brady, Ray Whelan, Rory O'Connell, Evan Duffy. Team 2: Niall Harte, Dylan Scott, James Connolly, Cian Becker, Eoin Darcy, Sean Dolan, Lorcan Flynn, Zach Kennedy, David Meskell. Team 3: Anthony Nolan, Pauric Mitchell, Daniel Cronin, Killian Lynam, Calum O'Neill, Sean Gilvarry, Daniel Doyle, Adam Gaughran, Max Dunne. Lucans U12A footballers played their fourth grading league game away to Castleknock on Saturday morning. Heavy rain before the match and a strong wind made conditions difficult for both teams. The Lucan boys, playing into the wind in the first half, showed a great intensity and work rate from the start and after Castleknock recorded the first point Lucan responded by working the ball up the field for a goal by Oscar Brennan. Lucan were defending very well with some strong tackling and were moving the ball well into the wind. A second goal followed for Lucan after some good build up play when a curving shot from Daniel Taaffe beat the Castleknock keeper. Lucan had to be on their toes to keep Castleknock out and some very assured catches and good clearances by stand in goalkeeper Mark Byrne helped keep Castleknock out. The Lucan defence was being well marshalled by Killian Costello with Cian Mc Cormick and Callum Reilly also to the fore in breaking up the Castleknock attacks and distributing the ball well to set up the Lucan attacks. Daniel Taaffe & Cian Gavin held the upper hand at midfield while Dylan Horan, Patrick O Connor and Oscar Brennan were showing well up front. A half time score of 2-2 to 0-2 put Lucan in a commanding position as they started the second half with the wind behind them. In the second half Lucan kept up their work rate and tackling but found it difficult to break down a packed Castleknock defence. Despite adding a few good scores, including goals from Cian Gavin and Michael O'Brien, Lucan were also guilty of some missed chances but which were not helped by the poor conditions. In the end Lucan’s boys recorded their fourth win of their grading league on a final score of 4-7 to 0-2. All in all lot of positives from the game but with a few areas still to work on. Well done to all players. Lucan Team & scorers M Byrne, C Healy, C McCormick, G Lynch, K Costello, C Reilly C Gavin (1-1), D Taaffe (1-2), A Leonard, M O'Brien (1-0), P O'Connor (0-2), O Brennan (1-1), D Horan (0-1), J Mills, J Dunne, Evan Flynn (Injured). 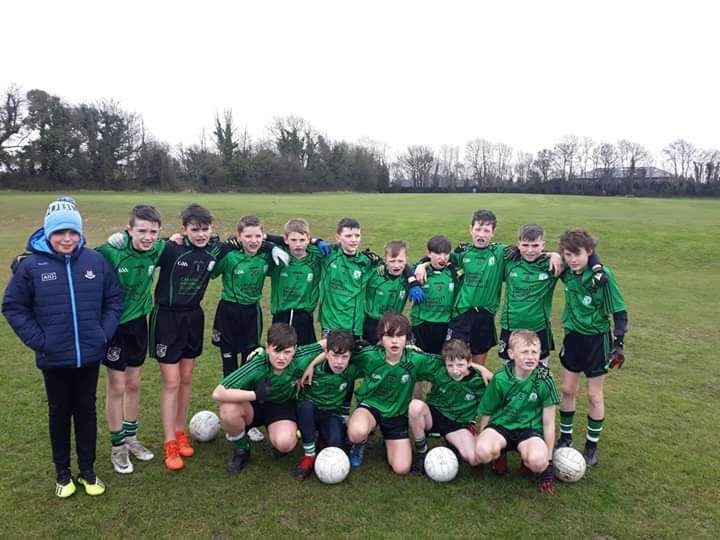 In the Under-12 Football C blitz Group 2 game played at St. Catherine’s Park, Lucan fell to a narrow defeat to Round Towers Lusk on a score line of 3-05 to 3-03.